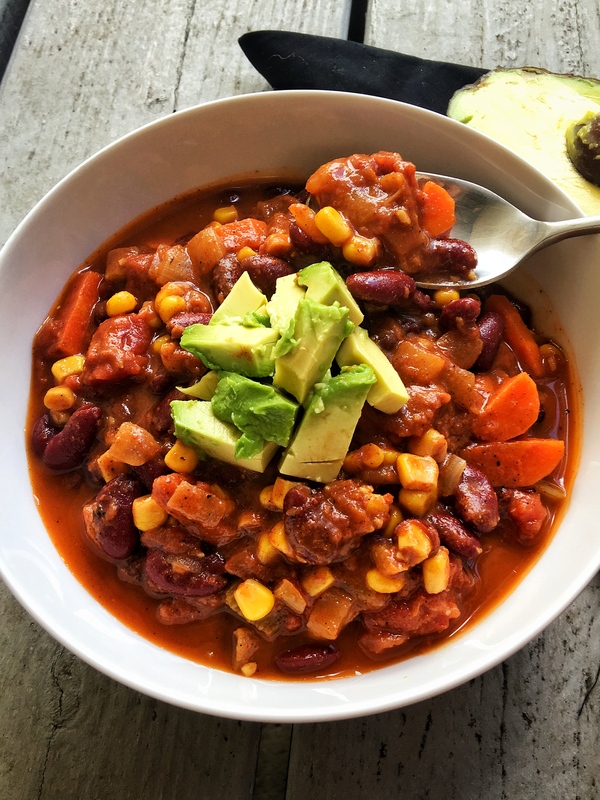 I’m really not sure why it has taken me this long to write this recipe post seeing as I make this chili so often that I have even resorted to buying the Costco packs of diced tomatoes and sweet corn… that’s almost embarrassing, but seriously, my (non-vegan) boyfriend and I both can’t get enough of it. I am one of those people who always likes to have really filling, hearty meals. You’ll probably never hear me say “I just want something light,” or “I’ll have the salad.” It’s just not satisfying to me to have a “light-meal.” Like? I’m freaking hungry over here. and most of all, deliciouso. Best of all, this recipe only uses one pot, for easy clean up, and can be kept well in the fridge for meals throughout the week. 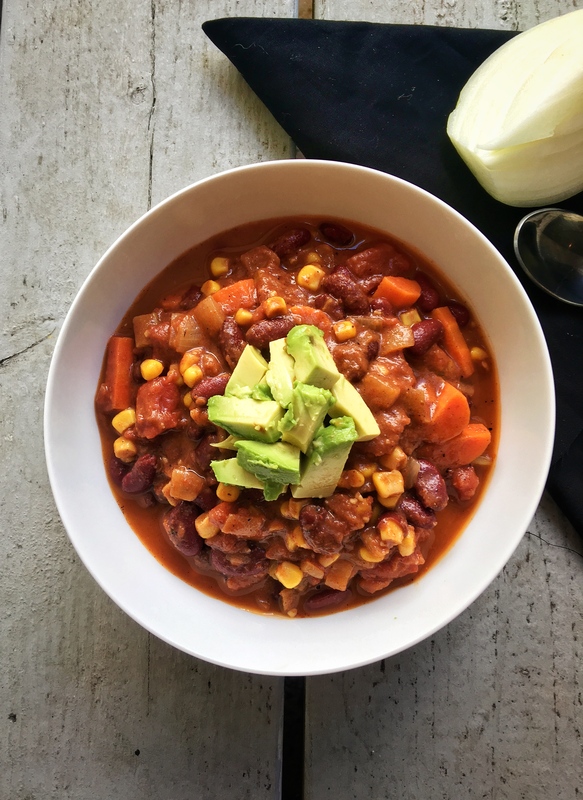 Feel free to mess around with the spices, this chili is pretty fool proof. As long as there is chili powder, you should be good to go. 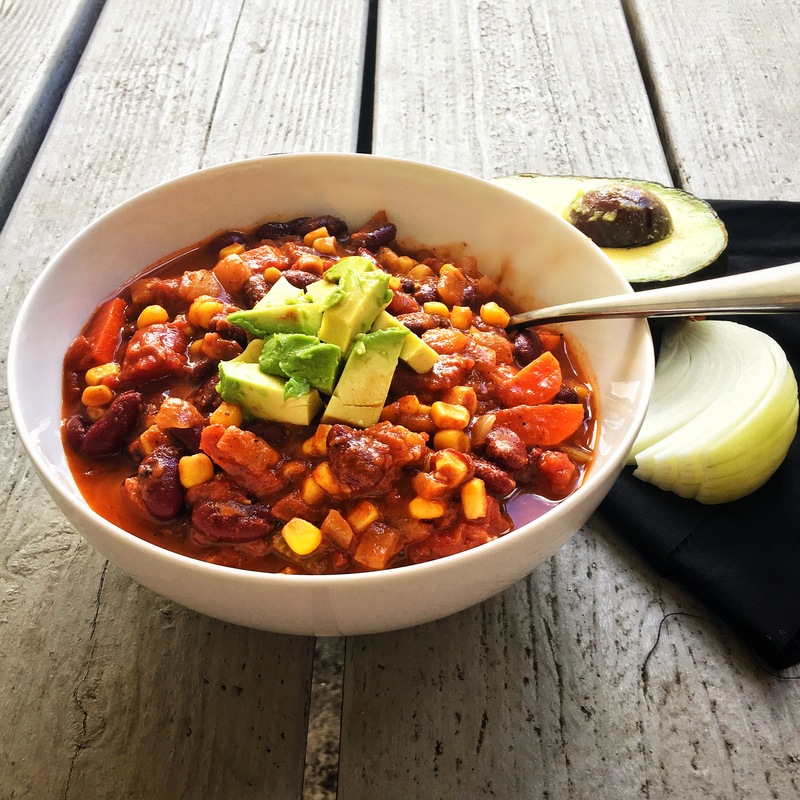 I have even made this using one of those pre-made chili spice packages, and that makes it even easier. Side note, I recently bought a new rice cooker that I have fallen in LOVE with. I have even made this chili using it! Just through all the ingredients in, hit the “Soup” setting, and BAM. Dinner is served. This is the one I have, highly highly recommend. Heat the olive oil and garlic in a large pot. When it begins to sizzle, add in the onion. Cook the onion and garlic until it starts to soften and becomes quite fragrant. Add in carrot and celery. Saute for about five minutes, stirring occasionally. Next, add tomatoes, beans, corn, spices and lime juice. Mix well. Add vegetable broth and let simmer for about 30 minutes. The chili should have reduced a bit and be a rich dark red color. Oh, and it will smell amazing as well. That’s it! Serve over rice and top with avocado, if you wish. Seriously, you won’t be disappointed!